Kit Livingstone’s great-grandfather has reappeared with an unbelievable story–one explorer knew the pathways to other worlds and tattooed his map onto his skin. Rival factions are in desperate competition to recover it and regain Paradise. It is the ultimate quest for the ultimate treasure. Chasing a map tattooed on human skin. Across an omniverse of intereing realities. To unravel the future of the future. Kit Livingston’s great-grandfather appears to him in a deserted alley during a tumultuous storm. He reveals an unbelievable story: that the ley lines throughout Britain are not merely the stuff of legend or the weekend hobby of deluded cranks, but pathways to other worlds. To those who know how to use them, they grant the ability to travel the multi-layered universe of which we ordinarily inhabit only a tiny part. One explorer knew more than most. Braving every danger, he toured both time and space on voyages of heroic discovery. Ever on his guard, and fearful of becoming lost in the cosmos, he developed an intricate code–a roadmap of symbols–that he tattooed onto his own body. This Skin Map has since been lost in time. Now the race is on to recover all the pieces and discover its secrets. The Bright Empires series–from acclaimed author Stephen Lawhead–is a unique blending of epic treasure hunt, ancient history, alternate realities, cutting-edge physics, philosophy, and mystery. The result is a page-turning, fantastical adventure like no other. At first when this book was available to review for Thomas Nelson last year, I was not interested. It did not seem intriguing to me at all. But when Thomas Nelson put the paperback version up for review, I decided to go for it. This tale is full of science and time travel, things that get your mind thinking. I enjoyed this book as an adventure book, because that is what it is, is it not? There was really no suspense to this book except toward the end. But I do not think that Stephen had it in mind to make it suspenseful. I believe that he wanted to make it a semi-lighthearted adventure book that you would enjoy on a rainy day. In this, he succeeds most definitely. The characters were great to tag along with as they got use to making jumps between place and time. My favorite in particular was Kit’s girlfriend, Wilhemina. Stephen does a splendid job in describing the numerous places we visit throughout the novel. From London to Egypt, I felt like I was actually there. This book is recommended to all of you who love adventure novels and books that drift you away to distant places. I received a copy of this book from the publisher for an honest review. All thoughts and opinions are mine. I agree, Evan. 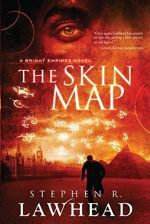 I read The Skin Map last year and LOVED it! Can’t wait for the next in the series. Just thought I’d let you know that this review made me want to check out the book. I’ve got it waiting for me as soon as I finish Forbidden and a couple other books I’m working on.